The word of God is essential in the development of a child. The children attend bible classes and worship at the Church of Christ. 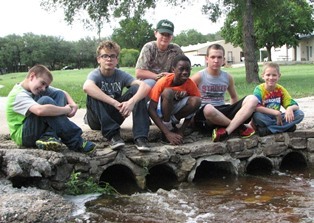 They are also involved in summer church camps and weekly summer youth meetings. Decency, moral character, a respect for God and man are some of the very basics taught. Developing these attributes will help the child understand and accept authority. "Reading, riting and rithmetic" - the three r's are important in the educational process of a child. The Cherokee Independent School District provides an education for the children, grades Kindergarten through 12. Headstart students are taken to San Saba for pre-school training. Special tutoring on our campus (W.P. Brummett Memorial Library) benefits each child at the level he or she may be in their educational endeavors. Students have opportunities to attend the college or university of their choosing. Many of the students will participate in poetry, prose, math, science, and many of the other competitive programs offered by the University Interscholastic League, or UIL.